How do you encourage Google to include the right information in it's knowledge graph? The KG is an important part of search engine reputation management. First introduced in May 2012 it provides information about a topic pulled from diverse data sources. Information in the Knowledge Graph is derived from Wikipedia, the CIA Factbook, Wikidata, Google Plus and other sources. Googles Knowledge Graph was a departure from simply providing search result links, instead it provides actual information without necessarily needing to click. Knowledge Graph summaries are often used for verbal responses to Google Now inquiries. Google Knowledge Graph is used in about 20% of all search results (one in five). It represents a move by Google to apply artificial intelligence to search results to improve results that are returned for a given search. It uses source material discussed in this article, and the accumulated human wisdom gained from actual searches people have done over time. Where Does Google Get the Information for Your Knowledge Graph? One of the main places Knowledge Graph looks for content is Wikipedia. A fully formed Wikipedia page that has been peer reviewed and contains images, references and citations is very helpful in every brands effort to engineer its Knowledge Graph data. Essentially, you'll need a Wikipedia page before you can have a Knowledge Graph. Before you can have Wikipedia bless you with a page you'll need trusted reference-able information online that can be cited. So the first thing to do is get online publications to write great things about you. Then build a Wikipedia page. Then do the rest of the things you'll need to do to reach that golden apex of internet notoriety - the Knowledge Graph. WikiData is a structured data repository that people and machines can update. WikiData uses structured markup so that machines can easily read the information contained therein. It is a highly organized language structure readable by search engine algorithms. 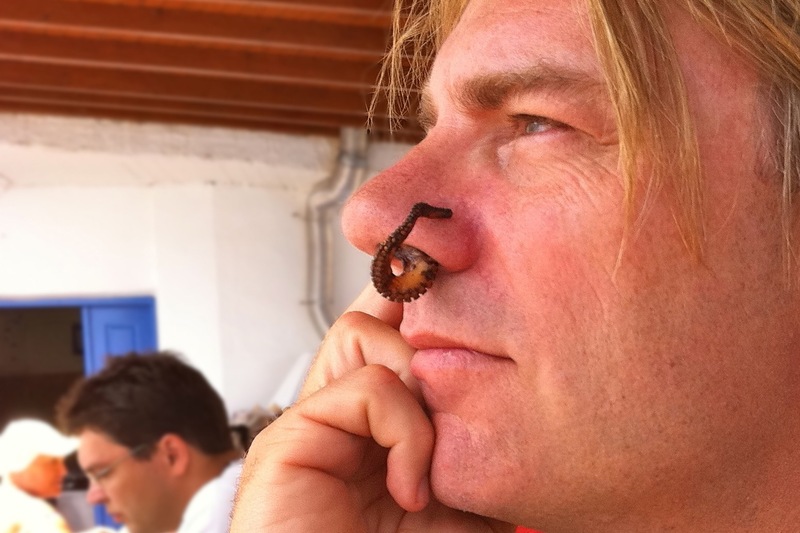 Wikidata pages are often created by machines, but improved by people. Anyone can update Wikidata. Wikidata succeeds Freebase, which was once used by Knowledge Graph. 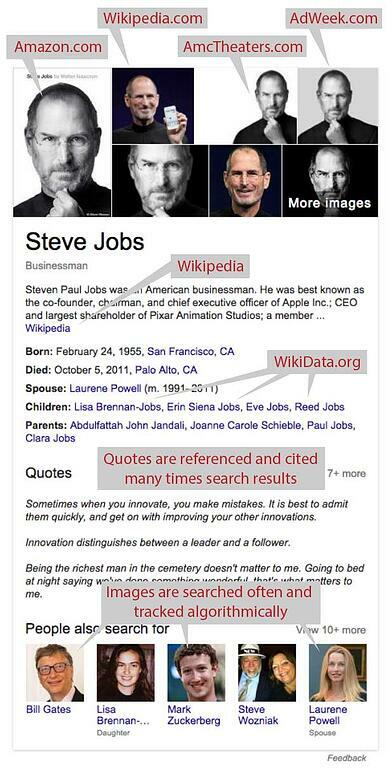 The example of Google Knowledge graphic using Steve Jobs describes how sources are used for a famous person. But business results are different - especially local ones. For this Google seems to use Google Plus business pages as a primary source of information for the contents of the graph. Google Knowledge Graph uses Google Plus as a source of information as well. Thumbnails that are placed in Knowledge Graph are often pulled from Google Plus and Google Maps. Schema markup is a kind of micro data language originally developed by Google, Bing and Yahoo. It helps search engines understand content better. By adding schema markup to web pages you control it is possible to positively affect how your brand is seen in search results (online reputation management). Schema.org is the first place to visit to learn more about it, specifically their page on Organization of Schemas. For brands, one of the most important types of micro data formatting includes the "Organization" schema. It includes address, brand, founder information, legal name, location and much more. A site like Schema Creator can help with the creation of micro data. Large companies don't just have more people (and money) than most small businesses, they also have different data sources. Many large companies are public and that means they have stock, and stock means financial results. 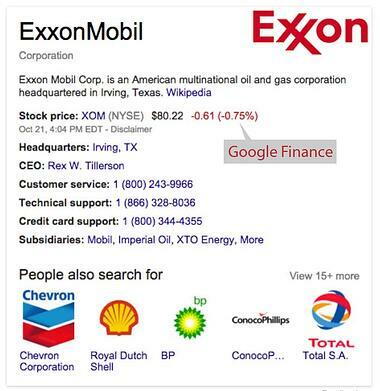 In this case Google uses Google Finance results. Location: The IP address a searcher is using. This gives away their probable location and flavors results, especially those of local businesses. Social media profiles of subject entities. Twitter and Facebook account information could show up. Actual queries of people over time craft the information contained in the graph.